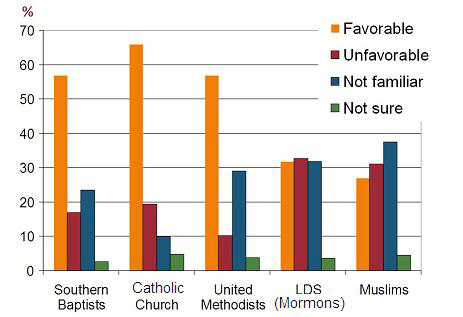 The positive outlook toward Southern Baptists, United Methodists and the Catholic Church was about the same in the survey, while the Church of Jesus Christ of Latter-day Saints (Mormons) and Muslims received less favorable ratings, 32 percent and 27 percent, respectively. Rick Beltram, an evangelical and chairman of the South Carolina’s Spartanburg County Republican Party, says he believes the poll is probably accurate, but also noted that a generic poll does not indicate how people feel about Romney after hearing him talk about his religion.”That’s obviously his biggest obstacle,” Beltram says of Romney’s faith in the Church of Jesus Christ of Latter-day Saints. “But I’ve also found that the more time that he or someone with him explains his beliefs, that’s not the case.” If Romney can dissuade voters from believing his faith is a cult, as some evangelicals view it, his support is likely to grow, Beltram says. “His job is going to be communicate, communicate and communicate,” Beltram says. I would be thrilled to hear Mitt Romney explain and communicate the doctrines of Mormonism. I myself campaign for the LDS Church to openly present its theology and customs to the world. It’s an exciting prospect; however, history and experience tell me this will not happen. Evangelicals hold the view that Mormonism is not a Christian faith. Because Mormons acknowledge works of Scripture that are not in the Bible, believe that their prophets have received revelations directly from God and teach that God has a physical body, Evangelicals consider them heretics. While all of this is basically true, the explanation is an extreme understatement of the facts as they are; it leaves readers with the mistaken impression that the theological concerns Christian faiths have with Mormonism are perhaps a bit trivial, and certainly not deserving of the majority of evangelicals saying they would not consider supporting the election of a Mormon for president. Though the LDS Church and Governor Romney may avoid answering the tough questions, answers are available for those who seek them. From the National Review Online blog row, The Corner has recently published representative emails from a few people who recognize that the problems with Mormonism are more significant than the media lets on. You can read them here and here. And, of course, factual information on Mormonism and how it compares with biblical Christianity is available 24/7 at Mormonism Research Ministry and many other fine web sites accessible through the MRM links page. This entry was posted in Mitt Romney. Bookmark the permalink.